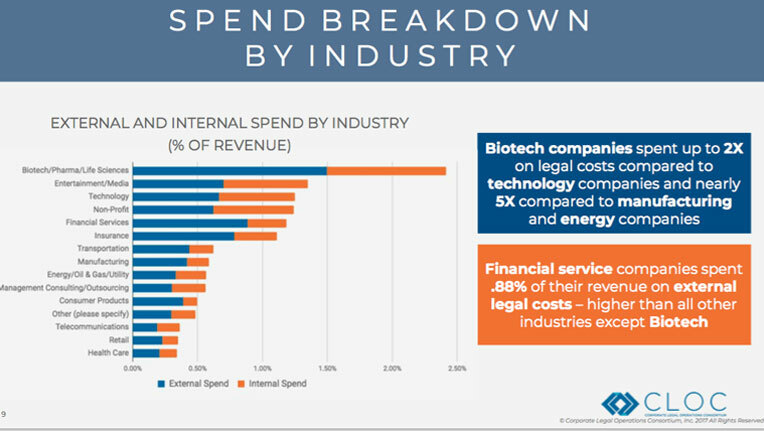 Biotech companies spent up to two times on legal costs compared to technology companies and nearly five times compared to manufacturing and energy companies. Financial services companies spent .88 per cent of their revenue on external legal costs — higher than all other industries except biotech. Jeff Franke, corporate secretary of CLOC and chief of staff and assistant general counsel, legal operations at Yahoo, said the reality is most legal departments have not reached the 50/50 stage. There is also a significant number of companies that are not using LSOs. “E-billing is the fundamental technology in any department. It is the first that any department puts in. You need to understand where your funds are being spent in order to make a series of decisions. I’m surprised there is the 17 per cent that did not have an e-billing system; otherwise, you are doing all your invoices by hand,” said Brenton. However, nearly half of respondents have no contract management system. There were 33 different vendors cited as those used by the 84 companies that said they do have a contract management system. Six vendors account for 58 per cent of the market share among respondents with a contract management system. In the top five were Apttus, Ariba, a custom or homegrown system, SpringCM and Icertis with Salesforce in sixth spot. Nearly two out of three survey respondents do not use alternative service providers, but 15 per cent of companies that use ASPs use three or more. Those in the top five were Elevate Services, Axiom, QuisLex, Integreon and Pangea3. The average external legal spend per in-house lawyer was US$607,000. A Canadian chapter of CLOC was recently formed with about 15 members. “Canada has been active in an informal way for a year and it looks like legal operations has taken hold in Canada and they’re interested in tapping into the CLOC community,” says Brenton. CLOC has grown rapidly since its inception with 25 regional groups forming in 18 months. “We are re-doing our infrastructure right now because we built two-lane roads and we should have been building highways. We really hit the tipping point and are now trying to make sure we are continuing to service members and provide content so everyone can do their jobs,” said Brenton. CLOC is also working on a number of initiatives including creating a set of definitions of metrics that legal departments should consider capturing when running an efficient legal department. For example, when capturing turnaround time for contracts, it will provide a definition of how to measure it, where to get the data source and how difficult it is to measure as well as whether you need technology to do it. Other standards already completed include fixed fees for IP, a legal project management checklist and a survey for when preparing for a quarterly business review of a service provider.